The Revolution system has many add-on boards, and a number of revisions of them. I've decided to make a separate page for them for organizational purposes. Note that some of these may no longer be available. The original 57076 capacitor bank had 6 capacitors on it, as Crest was learning about how glitches in power were affecting the Revolution. There are 6 inexpensive capacitors in parallel to make track power possible. From all the reports, it's apparent the Revolution is abnormally sensitive to electrical noise on the track inputs. (By the way, this is the problem DCC dealt with 20 years ago, so the Revo is not beyond DCC, but 10-15 years behind DCC in the handling of track power "glitches"). The dang thing is so big, you might have trouble getting all of your electronics into a hood type diesel. There is a small component in series with the leads, it's apparently a thermistor, with a negative temperature coefficient, i.e. 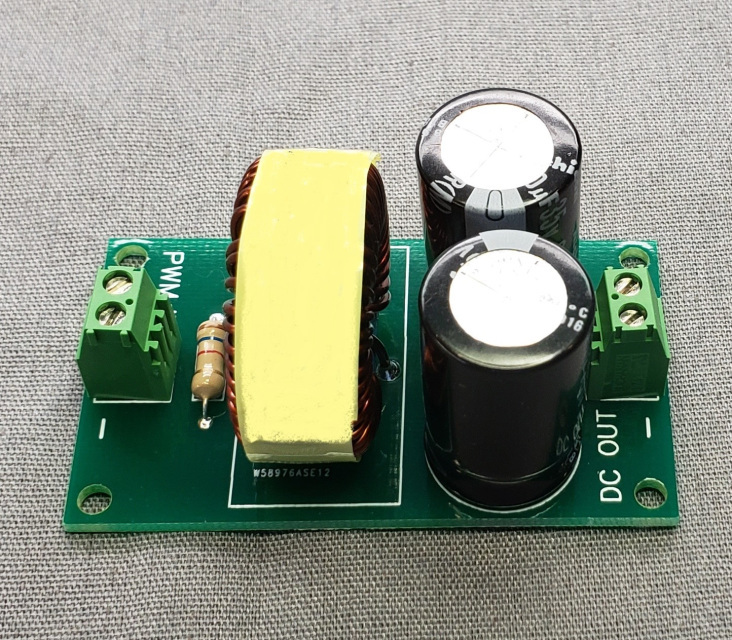 a component to limit inrush current. Good. It says NTC 100-9. It had 6 2,200mfd caps, for 13,200 mfd at 35v. I don't think this one is available any longer. This connects to 2 pins on the underside of the on board unit, and you can daisy-chain these cap boards if necessary. I question the 25 volt rating, good engineering practics is rating at double the working voltage to be safe with electrolytics. These should be at least 35 volt if not 50 volt for operation at 24 volts. At one time the system came with a single cap board. Note this cap is blown, and the voltage rating is 25 volts. I repeat that you should not use this anywhere near 24 volts. Notice the capacitor on the left has a "bulge" on the top. This is caused by gas buildup from defective (really cheap) capacitors. This is prevalent in the very cheap Chinese brands. This gas buildup is normally associated with an internal short, at the least it will stop working, this cap will eventually burn up, and sometimes they actually explode. There have been a number of versions are a number of "sockets" available. Top left is the socket supplied with the original Revolution "kit". It only connects to the 12 pin end of the board, and it has 2 fuses and 2 small diodes. The diodes are there to allow the headlight outputs to work. This is labeled UEXT-02 (v1.1). The original adapter board with 7 wires and no fuses was labeled UEXT-01. Apparently there is a new "half board" supplied with the system that has screw terminals, and the center terminals are so small they only accomodate one wire, a problem with some installations that have additional components. The later 7-screw terminal adapter CON1 also has the diodes behind the 12-position socket. Note: there have been several versions of this board. Bottom right is the board that allows any polarity to be input, (as in track power), so it has 4 large diodes for a full wave bridge and 2 capacitors to reduce the glitches prevalent in the Revolution upon short power interruptions. The part number is CRE57078. A new version has been released in the summer of 2009 that has 4 diodes and 2 caps on it, to allow the Revo to run from DCC or AC track power. It's not clear that the capacitors on it are sufficient to eliminate the track power problems acknowledged by Aristo. Lewis Polk says that it might work, but they recommend the 6 capacitor board for track power. Another board (same part number) was made available some time 2014-2016, no fuses, just the diodes. (The diodes are there to provide the "other end" of power for the headlights. The fusing was a bad idea in my opinion, trapping the fuses deep inside the loco makes it very inconvenient to replace them, put fuses where you can get them, or use self-resetting devices like a PolySwitch. 57079 - "active linear plug and play board"
In 2017 a new socket for the on board decoders was made available, with filtering to produce "linear" instead of PWM output, as well as diodes to rectify input voltage to a constant polarity and includes a socket too. Note: the Crest CRE-57079 was a full wave bridge rectifier, used to ensure proper polarity to the Revo when running from track power. Yes, I know they still call Pulse Width Modulation Pulse Width Control - no one else calls PWM anything but PWM. Not really sure under what conditions you would use this. The unit shown on the Precision RC site differs with 3 terminals as input: (but I cannot figure why, maybe like the new super receiver, the center terminal is not connected.) There are also 2 diodes on this board, you can just see one of them behind the nearest cap. So the middle terminal maybe could be used to bleed off power at some point? Maybe when the system is shut off, to discharge the caps? Note: this is a 24v dc fan.